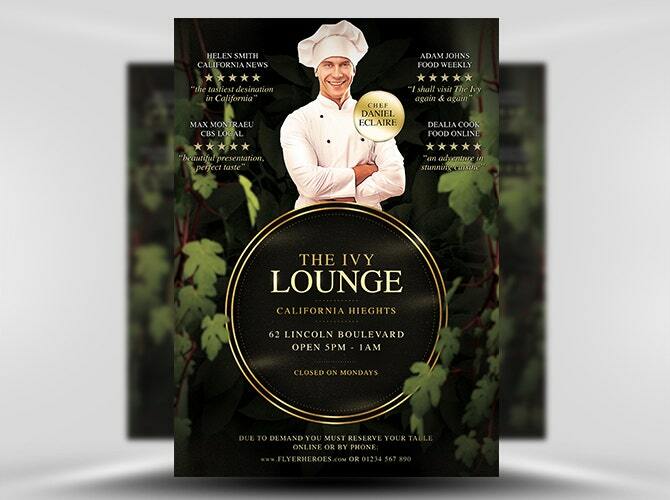 Flyer templates play an important role in every type of business. 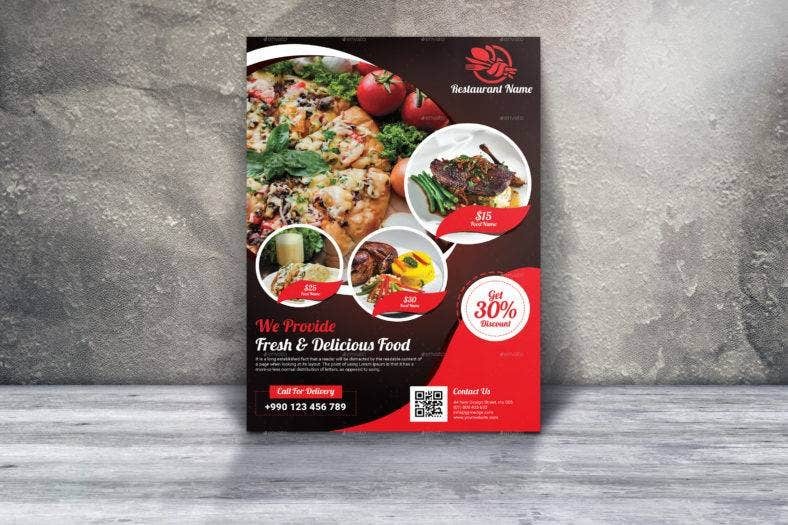 Whether it is in a physical print or digital format, flyers are major marketing tools that are used to inform people and your target market about an upcoming business, new product, sales promos, and many other purposes. They are deemed very useful with their unlimited creativity and design capabilities, tangibility, and measurability, as well as their ability to reach your audience of different demographics or a wide array of your chosen target market. 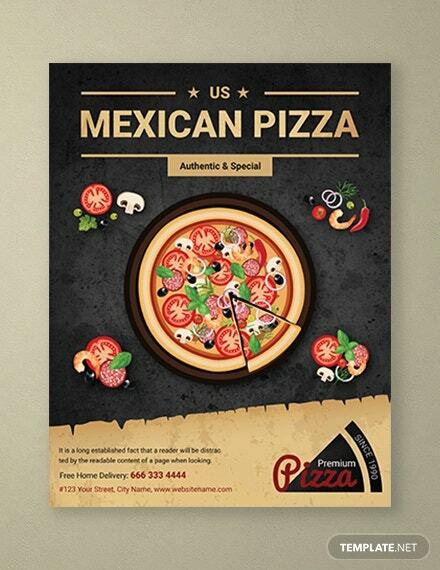 You can view several beautiful and creative restaurant flyers we have collected below. 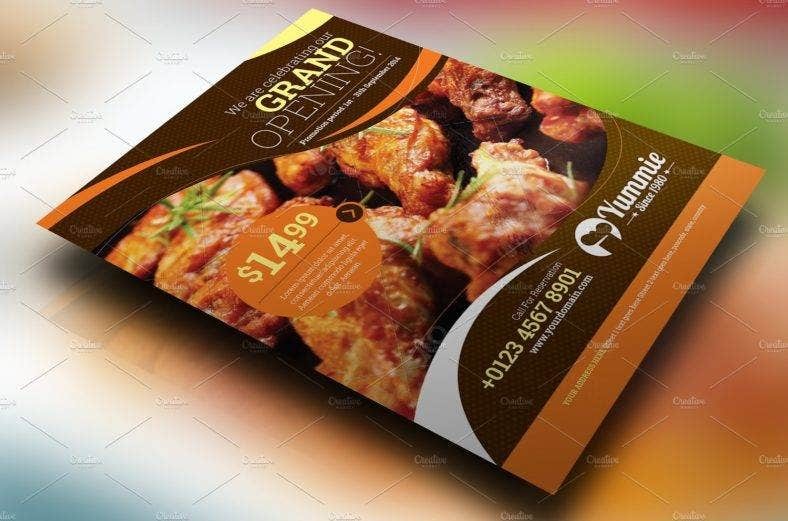 Whether you are opening a new restaurant and other types of food and beverage businesses or promoting an existing venture for a better presence in the industry and community, these flyer templates can serve as a good source of ideas and inspiration. 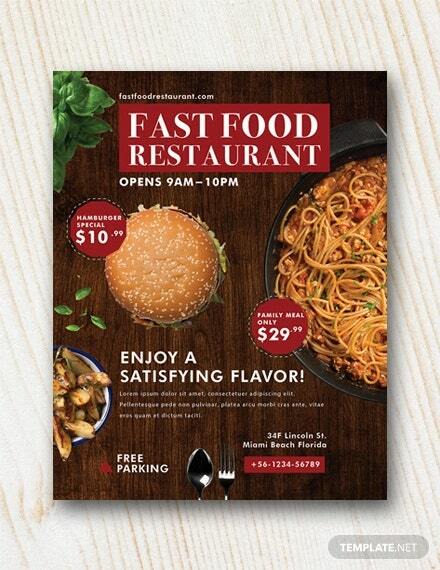 Not to mention, they are an affordable solution to promote your restaurant businesses without sacrificing professionally-designed layouts and high-quality materials. So, what are you waiting for? 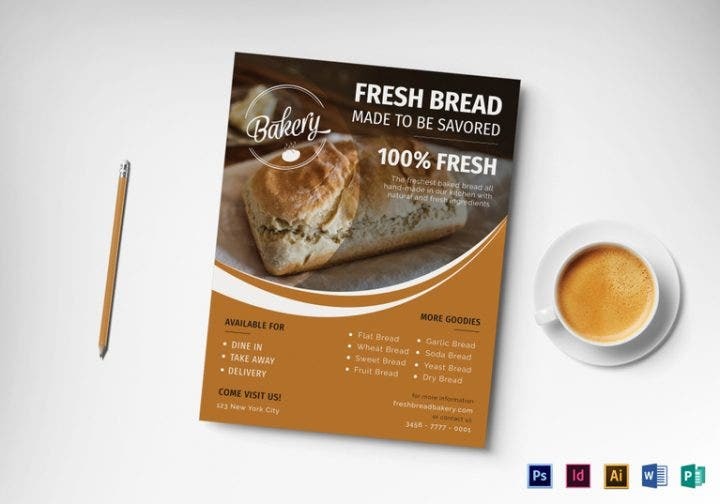 Dig into these goodies and choose the perfect flyer design that matches your vision. 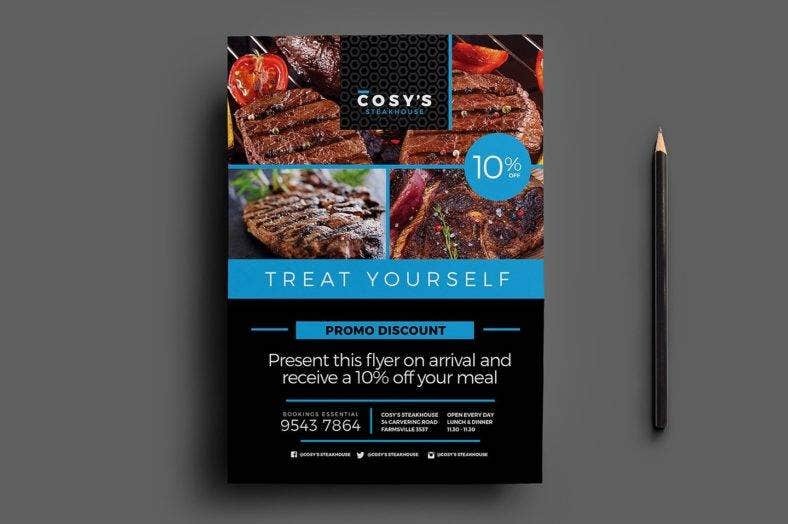 Help your business grow to new heights with one or any of these restaurant flyer templates which have been carefully chosen to cater to all your business needs. First of all, here is a chalkboard flyer for restaurants. This type of design is quite popular nowadays. As the number of young people who are trying their hands on small businesses increases, chalkboards become an efficient and economical way to present their menus and promos. That is why this template took on this aesthetic in order to look modern but practical. It is print-ready and comes in four flyer sizes with organized and detailed layers, so it is easy to edit and customize. 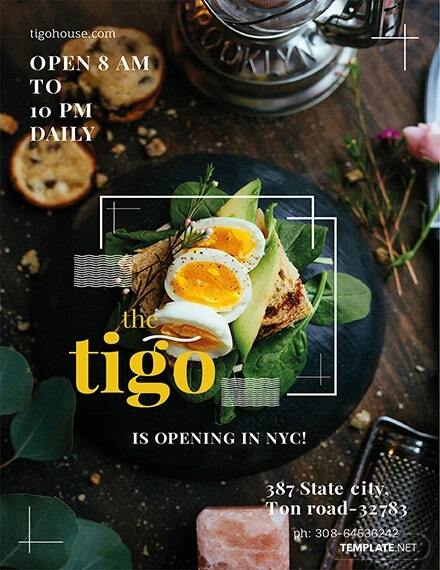 Claiming to be the best restaurant flyer ever, this template boasts of a gorgeous design and great customizability. It comes with two print-ready Photoshop files with various designs. It can also be used for coffee shops, bakery shops, and pizza restaurants. 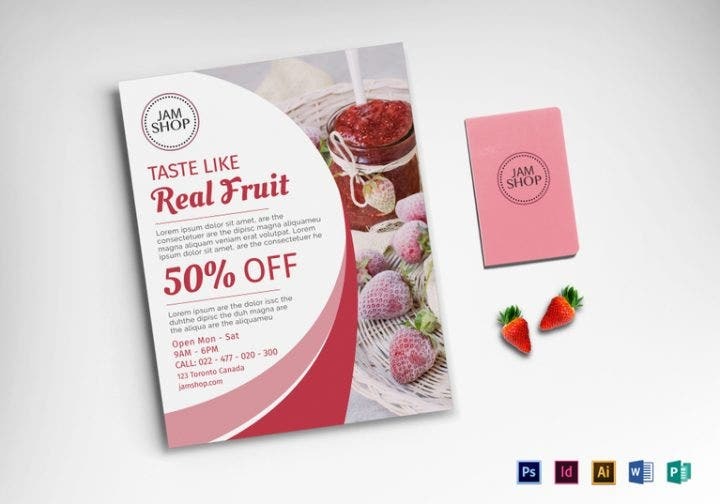 Not including the images, this modern flyer template allows you to easily change the texts and colors as well as add or remove objects to its layered PSD file. 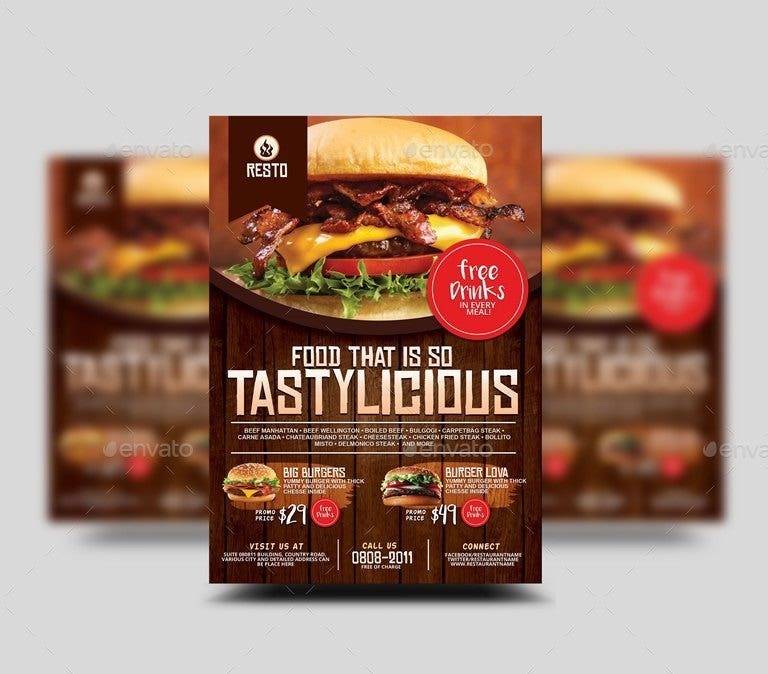 Next is this multipurpose flyer that is designed for various food-related business which include restaurants, hotels, coffee shops, fast food chains, and many others. A helpful tool for marketing and branding, this template comes with a bunch of modern features that allows full creativity as the template is highly customizable and includes PSD, AI, and vector EPS formats. This template is definitely a great choice with its unique design. 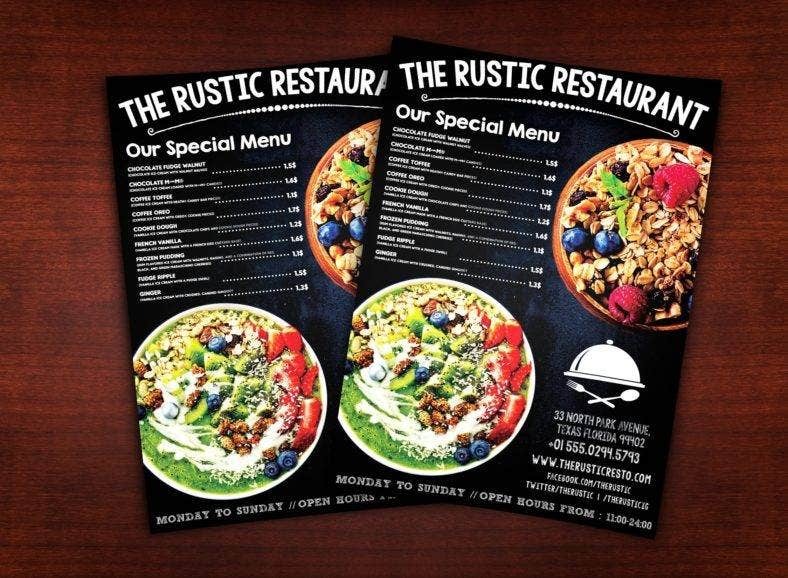 A bright and colorful restaurant flyer, this graphical template has a unique and modern design with a clean and dynamic layout which will surely catch the attention of your target market. It comes with fully editable Illustrator AI and EPS files in three color variations for you to use and customize in Adobe Illustrator CS5 and other later versions. It uses a CMYK color mode and has a size of 8.5 x 11 inches with 0.125 bleeds. 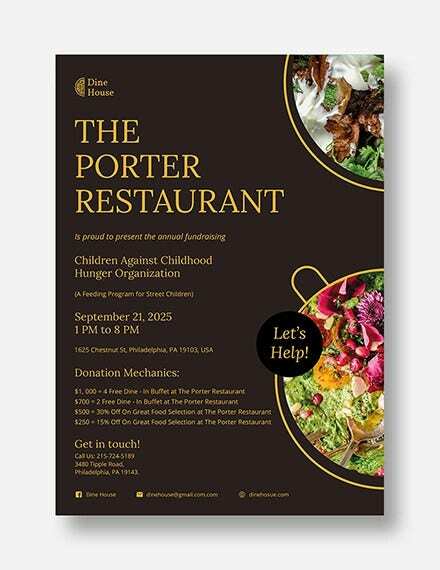 This simple but dynamic restaurant opening flyer template is perfect to use for any food and beverage-related businesses as it comes with three color variations to make sure it matches any type of restaurant and food establishment. Fully layered, it can be easily edited or customized by using Adobe Photoshop. It also includes a Smart Object layer where you can edit your own images effortlessly. The template comes in letter and A4 sizes with a CMYK color model. 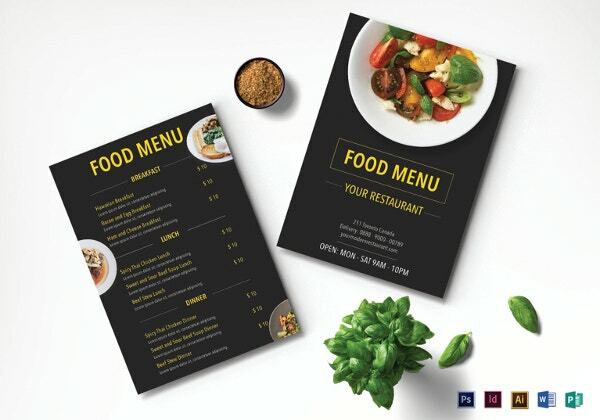 Developed to help restaurant businesses, whether big or small, to enhance their marketing strategies and raise awareness among their potential customers, this restaurant flyer template has a well-designed layout and optimized marketing content that will surely attract new customers and boost your sales. 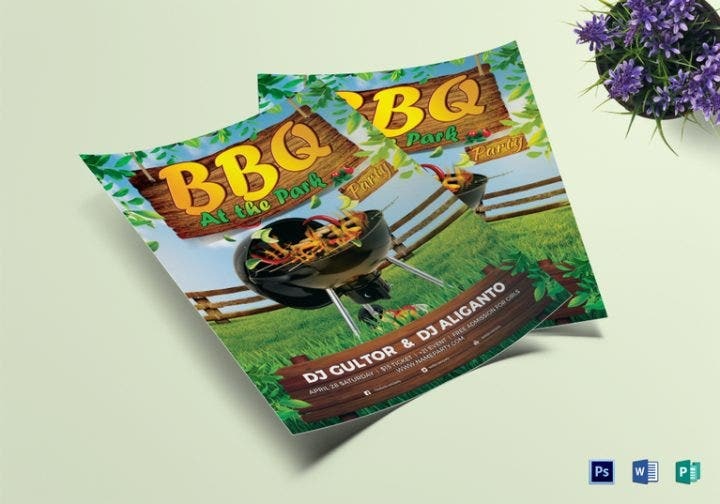 It comes with a high-quality, print-ready, CMYK format at high-resolution 300dpi and a fully layered PSD file that is easily customizable and editable. 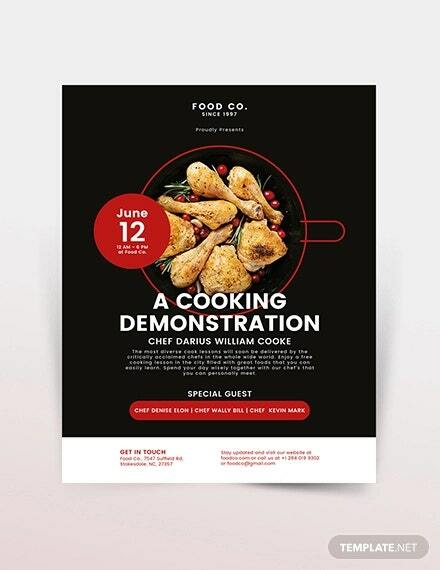 Intended for fast food restaurants, this rather dark and minimalist flyer template can also be used for other purposes such as corporate events, business launches, and such. 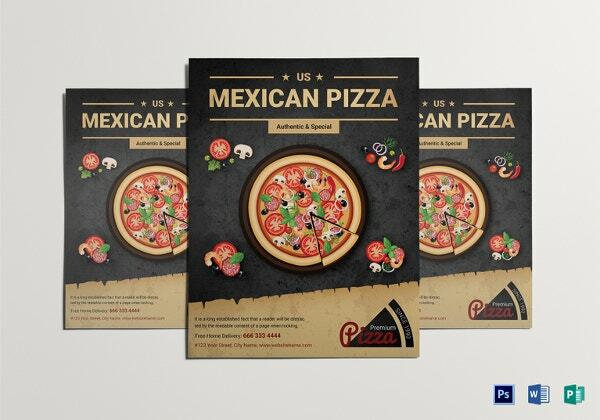 It is A4-sized and comes in a standard 300dpi CMYK print-ready PSD file with bleeds and guides. Moreover, this template allows you to edit the text layers and color shape layers pretty easily, while the fonts and images are included in the package so you won’t have to pay for them. 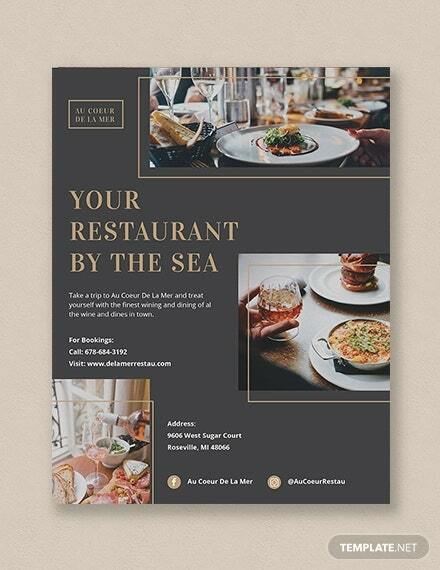 Stunning, elegant, and classy, this restaurant flyer template is a perfect marketing tool to promote your fine dining restaurants, lounges, bars, and even hotels. Its timeless font style and luscious vines background creates an impressive design with an exceptionally high quality that you and your customers will absolutely love. It also includes plenty of space to change and insert your own text and images, which is made quick and easy with a well-organized and color-coded layer structure. 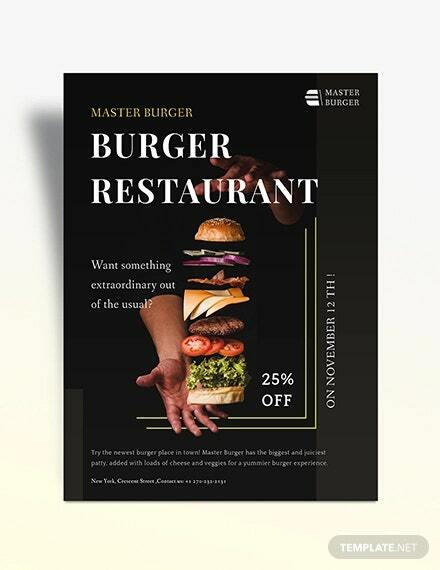 The unique and modern restaurant flyer template you see above is a business flyer template which is made to be the perfect graphic design tool for your restaurant. 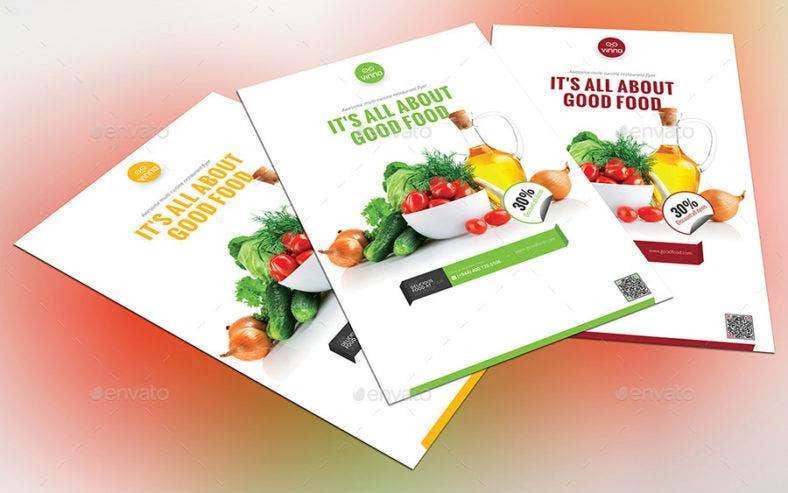 With a well-thought layout and stunning color schemes that come in four variations, this template can also be used not just for food-related businesses, but also for other types of endeavors and ventures. All the text, colors, images, and fonts are user-friendly and easy to customize with Adobe Photoshop. 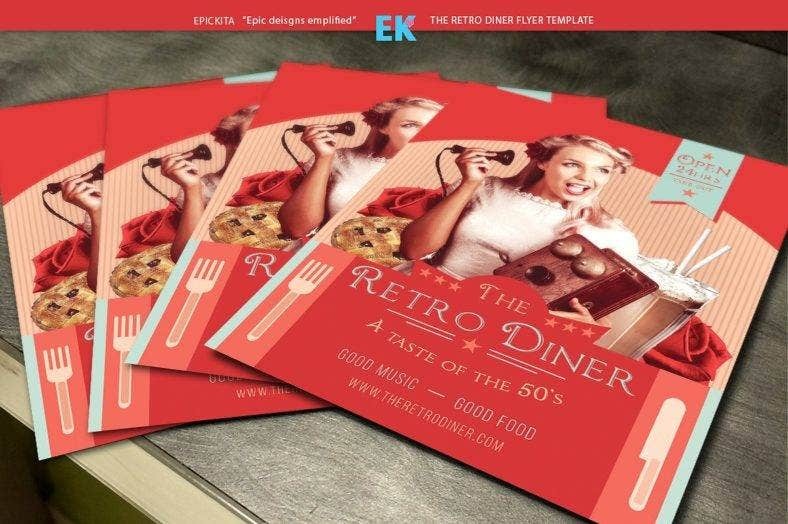 Here is a stylish vintage flyer template for restaurants which is obviously and specially made for retro diners but can also be used by fine dining restaurants or food places with an elegant and sophisticated feel. It uses a system font and includes six color options to choose from. Thanks to its well-arranged layers in the file, this template is easy to use and edit, so you will be able to quickly and instantly modify the template to suit your needs. 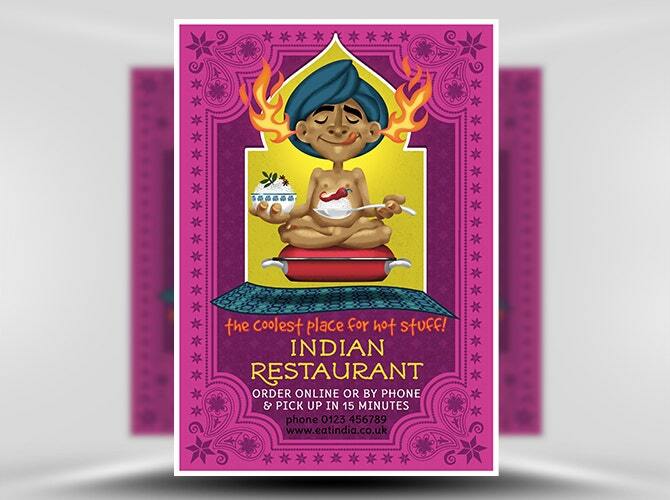 Different types of cuisines from around the world are used as concepts for various restaurant and food businesses, such as this Indian restaurant flyer. 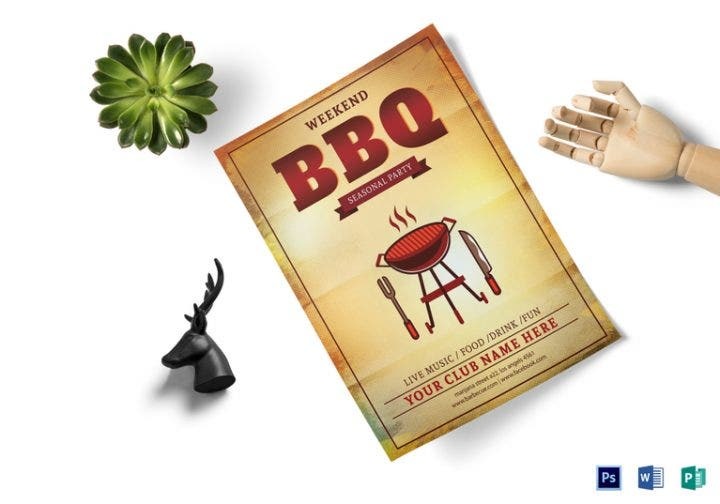 Hand illustrated and integrated with a palatial window-frame background and patterns, this template is guaranteed to draw the attention and satiate your potential customer’s appetite while the text and image areas allow you to add custom images according to your preference. 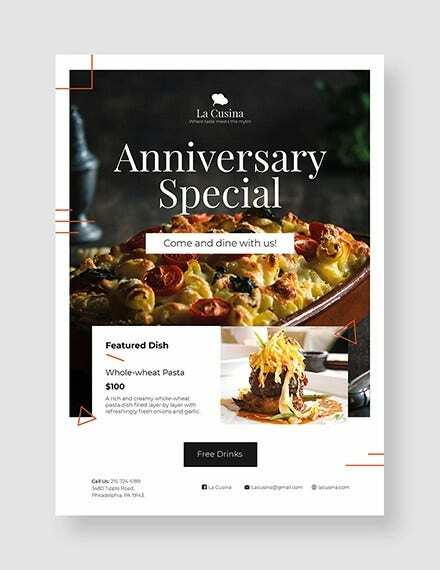 Italian food is a favorite of a lot of people, so here is a restaurant template that will help you rise above your many competitors and showcase your special Italian dishes. 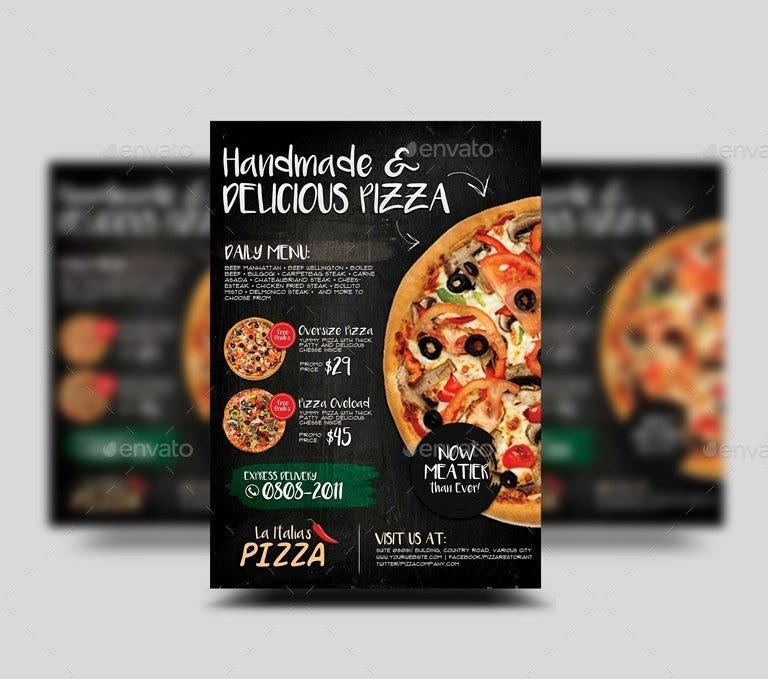 This pizza, burger, and pasta restaurant flyer template is characterized by a rustic, dark background which helps enhance the food images, making them look so tasty and delicious. The template comes in well-organized layers for easy editing and a 300dpi CMYK color mode for higher print quality. Special holidays such as Thanksgiving Day can be a lucrative opportunity for restaurants and other food places as they can make a significant profit with families and groups looking for a place other than their homes to celebrate the occasion. 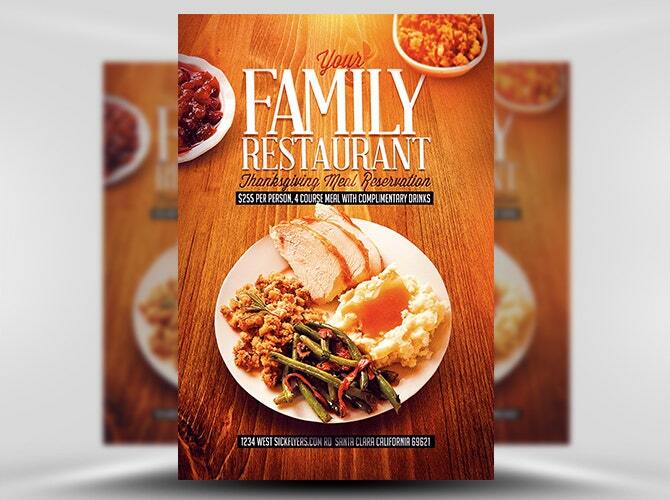 And that is why this Thanksgiving flyer for restaurants is created to help you market your holiday promotions with the local community. It comes with warm inviting colors and multiple headlines and text areas to add essential information. 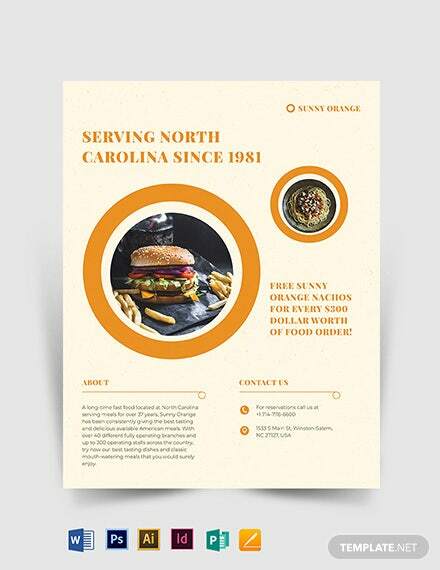 On the other hand, here is a clean and minimalist restaurant flyer template with lots of white space and some bright touches of color which help highlight your content better. 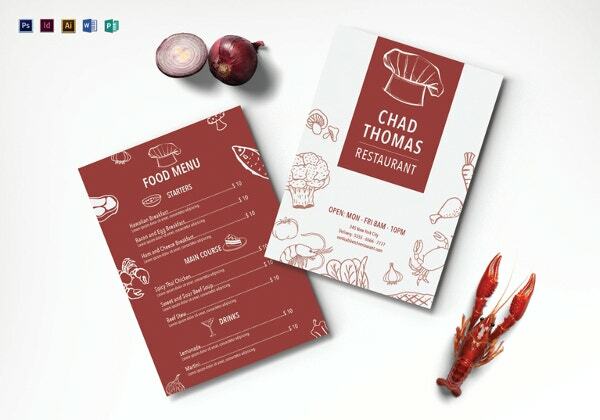 It includes multiple color scheme options, so it perfectly fits any kind of food and beverage businesses such as restaurants, cafes, fast food joints, coffee shops, bars, and more. It is easy to edit and customize thanks to its well-organized layered file and help guide included in the package. 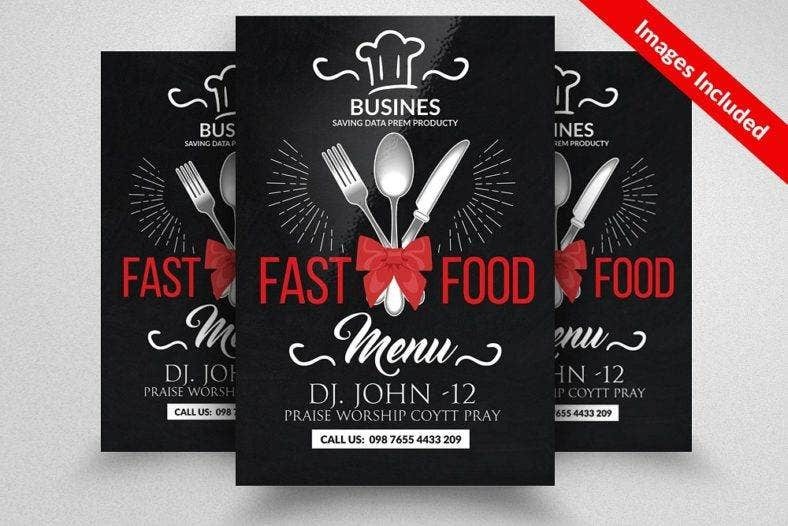 If you are looking for a more sophisticated look for your restaurant flyers, then this is the right template for you. Dark-themed but with a touch of color, you will be able to create an interesting professional-looking marketing material. 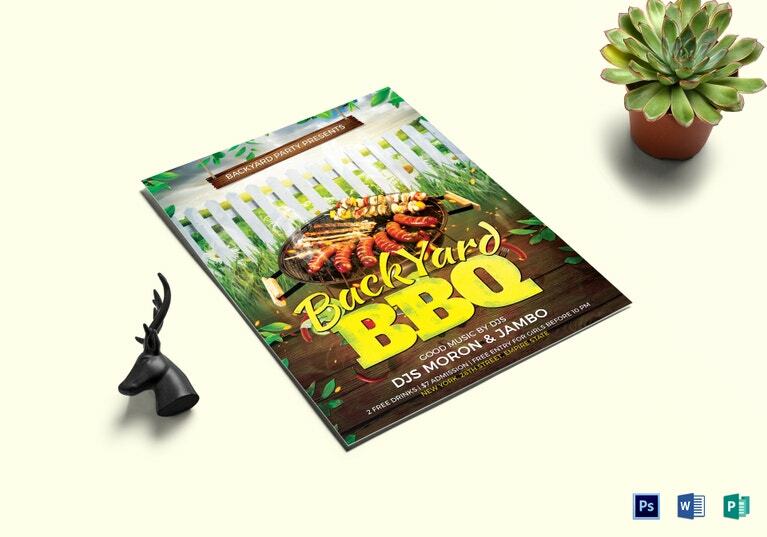 The template comes in 300dpi CMYK print-ready Photoshop and Illustrator files with clearly labeled and well-organized layers for easy customization. All the stock photos you see in this template are included in the package. 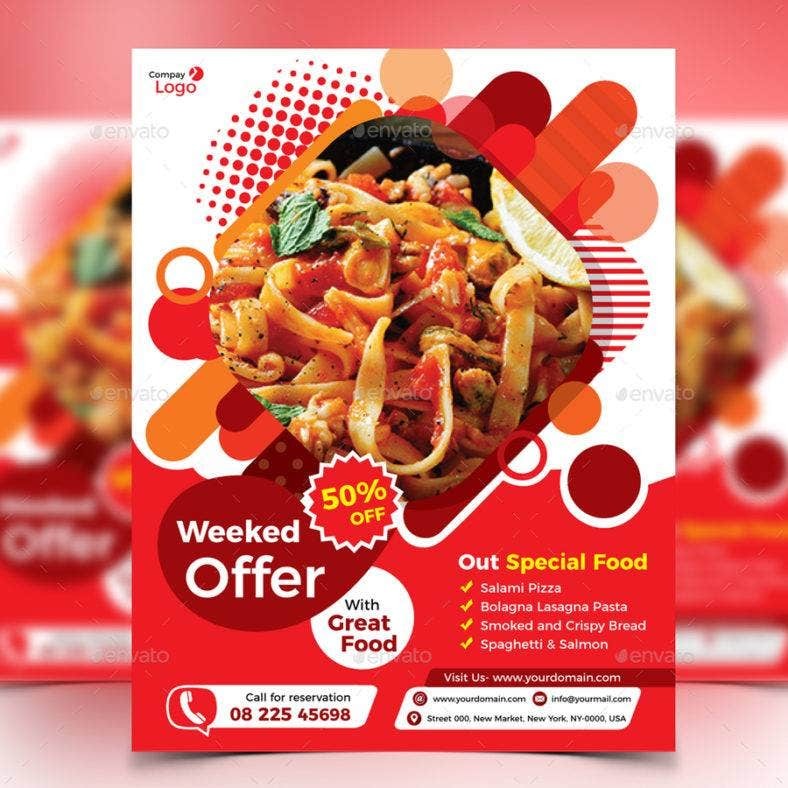 Last but definitely not the least is this restaurant flyer template used to advertise your restaurant’s weekly specials and entice more customers to come and enjoy your place with their family and friends during special occasions. 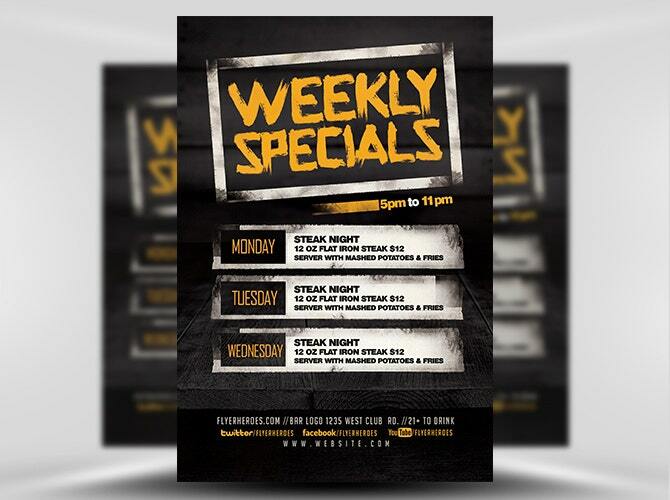 The weekly specials advertising flyer template features a dark background with bright elements such as texts and images. It is also fully customizable with professionally organized layers for easy editing. 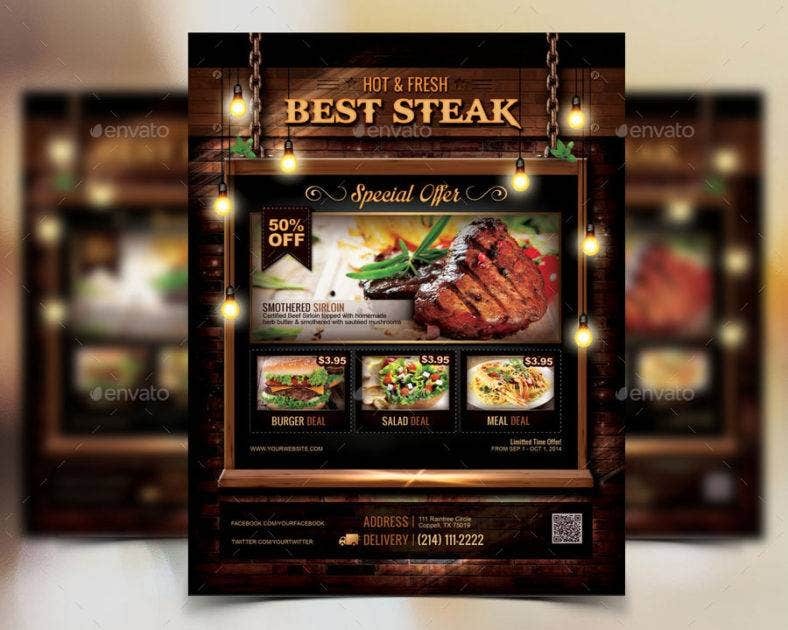 As a conclusion, we hope that you did not waste your time and found exactly what you were looking for in this list of marketing flyers for your restaurant. 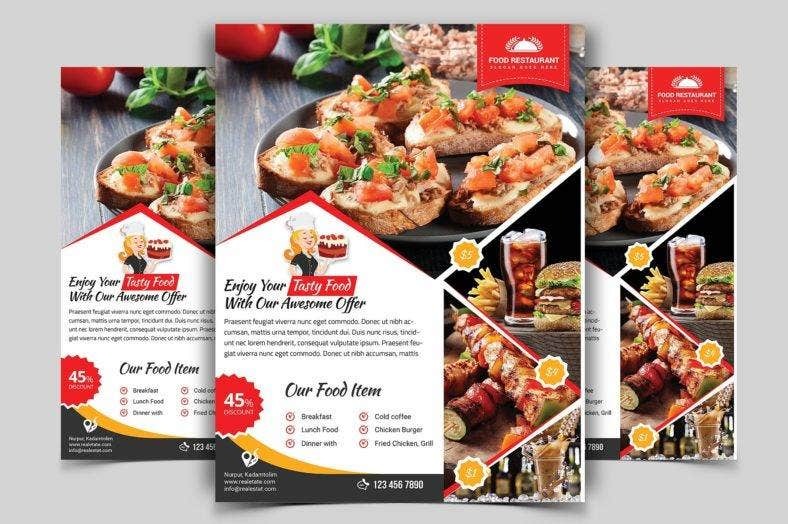 With lots of features and ease of usage and customization, each of these templates is guaranteed to provide you with all the benefits of using a flyer to promote your business.